Join us for the AgrAbility Regional Training Workshop - Ft. Collins, CO Sept. 30th – Oct. 1st, 2014 at CSU’s Agricultural Research Development and Education Center. Register now via the following link: https://www.regonline.com/coloradoregionalagrability. Regional Training Workshops are a great way to network with AgrAbility peers and other professionals that have a role in assisting our clients. The AgrAbility Regional Training Workshop in Ft. Collins will focus on FSA farm loans, business plans for farmers, veterans and farming, niche farming-fowl, Action Trackchair, beginning farmers program, and women in ranching. A tour of CSU’s Agricultural Research Development and Education Center on day two will allow us to do some farm assessment with Steve Swain. ARTHRITIS CONFERENCE PLANNING COMMITTEE MEMBERS NEEDED! A 2nd National Arthritis Conference is being planned and a committee has been formed. This national conference is scheduled for 2015 and more details will be forthcoming. There are still positions available on the planning committee. Contact Amber Wolfe at awolfe@arthritis.org for more information. The next planning call is October 15th at 12:00 PM EST. Bill Field and Chuck Baldwin helped coordinate the AgrAbility 1890 Land-grant University Workshop held at the University of Maryland Eastern Shore Aug. 14-15. Thirteen people participated from five 1890 Universities: DE State, U. of MD Eastern Shore, N.C. A&T, VA State, WV State; and eight others participated from the NAP, U. of DE, Mid-Atlantic AgrAbility, WV University, N.C. Dept. of Ag, Bay Area Center for Independent Living. A highlight of the workshop was the farmer panel where four farmers shared their stories of how they came to know about AgrAbility and what AgrAbility has meant to them, their families, and their communities. One participant at the workshop may have shared it best when she said that she really wasn't clear about what AgrAbility did until she heard the farmer panel share their experiences, and now she sees how important AgrAbility is and she's excited about promoting it to others. Chuck Baldwin highly recommends the Florida Small Farms and Alternative Enterprises Conference in Kissimmee, FL, he attended Aug. 1 & 2. Nearly 600 people attended, 21 educational sessions were presented with 57 speakers, 74 exhibits were showcased, 17 educational posters were displayed and there were several livestock demonstrations, plus 3 pre-conference food and farm tours. Participants enjoyed a great diversity of delicious food (like Florida Gator Bites Cajun Style, Port Canaveral Shrimp w/Goat Cheese Grits, and Chuck's personal favorite: Calabaza Pumpkin & Blue Hubbard Squash Mousse topped with an edible marigold) from Florida small farms prepared by talented chefs. F riday evening's social was a great time to gain many new contacts. And Chuck joined the exhibitors who were offering door-prizes for the first time with great results: 14 new contacts and the door-prize winner who turned out to be a retired librarian working with many people with disabilities; particularly the blind. She was thrilled to have Josh Bleill's book to read and to share with others! The National AgrAbility Project staffed a display in the health and safety tent at the 2014 Farm Progress Show near Boone, Iowa. It was a rainy, weather-shortened outdoor farm show. Information was provided to many farmers with disabilities and to their families and neighbors. 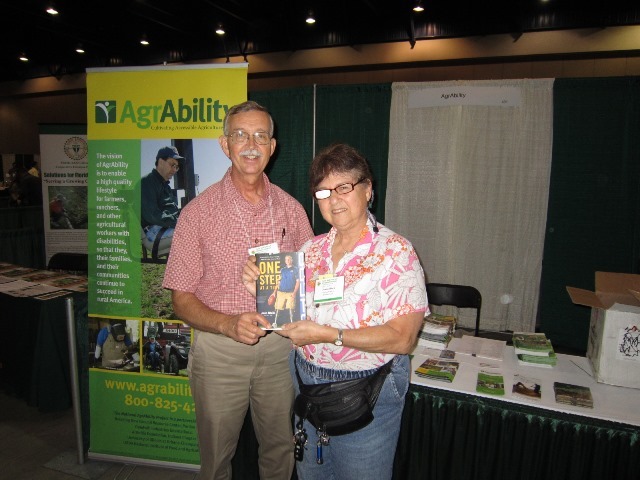 The display included AgrAbility materials, Arthritis and Agriculture booklets, Back on the Farm, Back in the Saddle booklets, veteran information, AgrAbility case studies, and contact information for each SRAP.